Sophomore Grace Steensma strides during a warmup on Friday, Jan. 26. Steensma trains above and beyond the typical Monday through Thursday to reach her personal goal of a six minute mile. Spring sports tryouts do not start for another three weeks, but many students have begun weightlifting and conditioning for their individual sports after school on Mondays through Thursdays..
“We do warm-ups, then a quick stretch and count together as a team as we stretch. It’s really a good bonding experience,” said sophomore Natalie Kallen. Kallen is playing lacrosse for the first time this year and hopes to improve skill-based techniques before the season starts. Returning members must take charge of practices in the winter months because MHSAA rules prohibit coached sessions before the regular season. “I am not supposed to teach or instruct individual sport skills before the season, but since the winter sessions are for everyone we do not practice specific techniques,” said boys’ volleyball coach Chris Frankenfield. However, the rules do not prohibit groups of students from working out to get back to basic fitness. 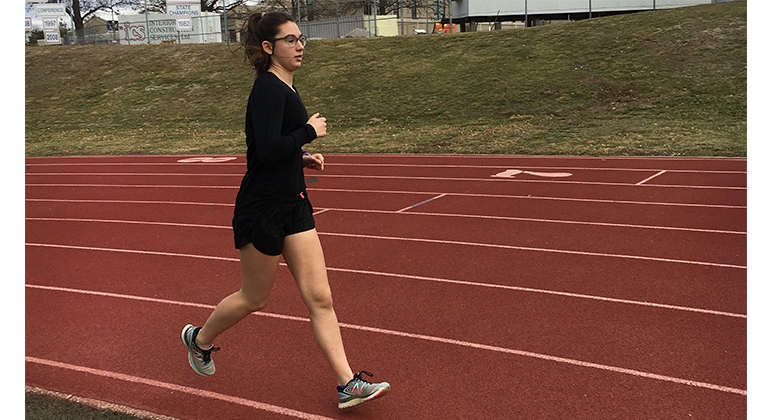 “Winter training is all about building a base so the first couple of weeks are not as difficult,” said sophomore Grace Steensma. Steensma trains more than just Monday-Thursday and makes sure to be active on the weekend. She hopes to break a six minute mile by the end of this season. “Today, I have a speed workout: 2×800 around 3k pace and 4×400 around a mile pace, with one minute rests in between,” said Steensma. Winter workouts widely differ from those during the regular season, as day-to-day practices usually focus on observed weaknesses from competition. “Right now, we do more weightlifting to enhance core; whereas during the season, we focus on running aspects and various techniques,” said McNeal. The coaches have specific goals for athletes in winter to prepare for the season ahead. “The training helps with strength, agility, and injury prevention,” said Frankenfield. In contrast, lacrosse players have different skill sets to strengthen in order to utilize specific plays in the games. “We all practice cradling, which is having your stick up to keep the ball from being knocked out. Everyone has a personalized cradle,” said Kallen. Overall, the clear message in winter is preparation for the upcoming season. Even with all of the pre-season conditioning, predictions for the season are unclear. “We lost many seniors last year, and it’s hard to tell who will fill their spots,” said Frankenfield. The spring sport season begins Feb. 26.